The recent change in our political leadership didn’t come as a great surprise, but its timing did. Astrology can explain that better than many political analysts or the gossip columns, I think. This eventful month of September coincides with the last eclipse season for 2015. The ballot to decide the fate of our former PM, held on September 14, 9.15 pm, happened just a day from the Virgo Solar Eclipse on September 13, 4.41 pm (Eastern Standard Time). An Eclipse of the Sun is, first of all, a New Moon, a time for new beginnings. When this is also an eclipse, the new beginning often represents a major shift, with long lasting repercussions. 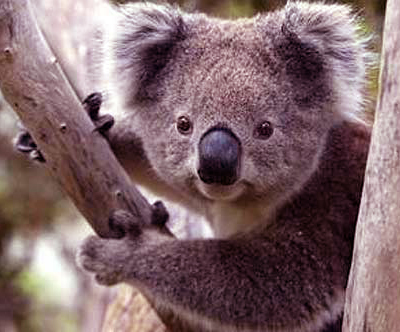 Tony Abbott’s was born in London on November 4 1957, 4 am. Here is a link to a post about Abbott when opposition leader and his Sunrise Horoscope, before his time of birth, 4 am, was confirmed. 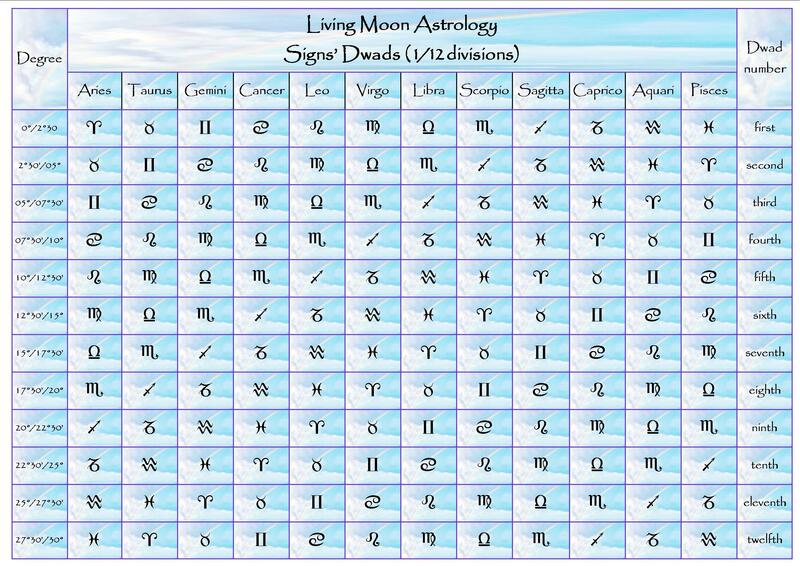 See below for his proper Natal Chart. The degree of the solar eclipse fell in the astrological sector of his Natal Horoscope described as the House of self-undoing, manifesting as the sort of events that are out of the individual’s control (12th House). The next Total Moon Eclipse, on September 28, will align nearly perfectly instead with his Aries Moon. 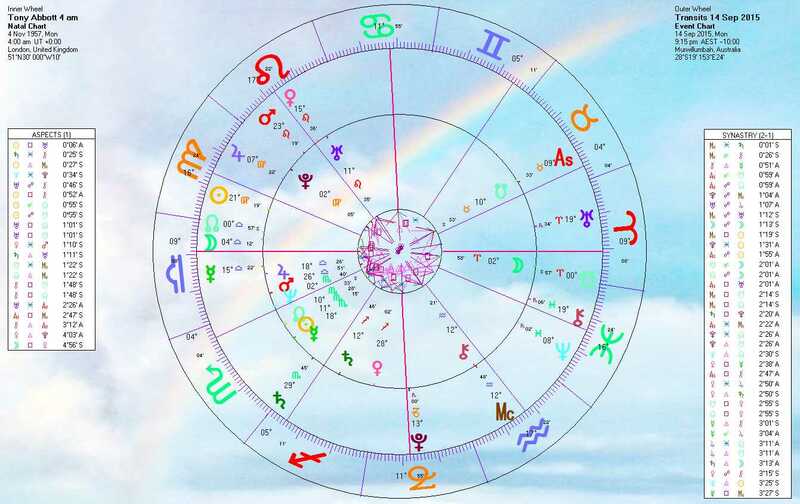 The areas where Sun and Moon are located during this eclipse show Abbott’s present need for sacrifice, humility and discrimination (6th and 12th Houses). I also believe he will probably fight on, in some ways, the Lunar Eclipse spurring into action the fiery spirit of his Aries Moon. 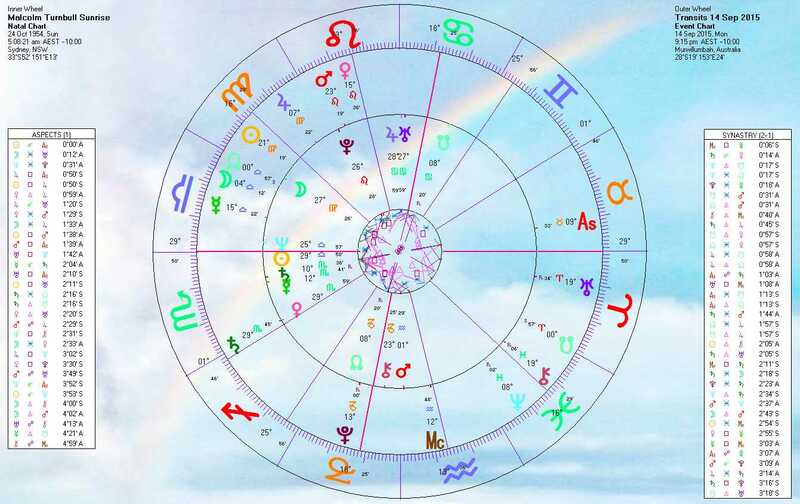 Here are three Transits Charts imposed upon Tony Abbott’s Natal Chart, at the time of the two Eclipses and the ballot. Eclipses tend to have a long lasting effect on individuals and the collective, these last ones spreading their vibes all the way to the next eclipse season in March 2016 and beyond. A lucky star is shining on Malcolm Turnbull at present (born Sydney, Oct-24-1954, time undisclosed. See his Sunrise Chart below). He was chosen to become our new PM just as the transiting Saturn became aligned to his Birth Venus on the cusp Scorpio-Sagittarius. This conjunction can occur only once in 29 and half years. The odds of that happening as he became PM would be very high indeed! To all students of Astrology this clearly shows how positive a Saturn’s transit can be, despite this planet’s reputation for hard work and little pay/joy. 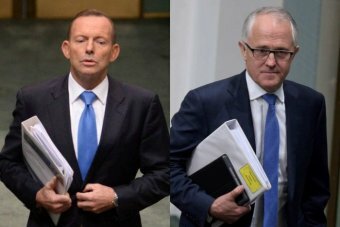 Saturn also helps to consolidate and make factual, in this case Turnbull’s long held wish to become PM (Venus on a cusp of power). 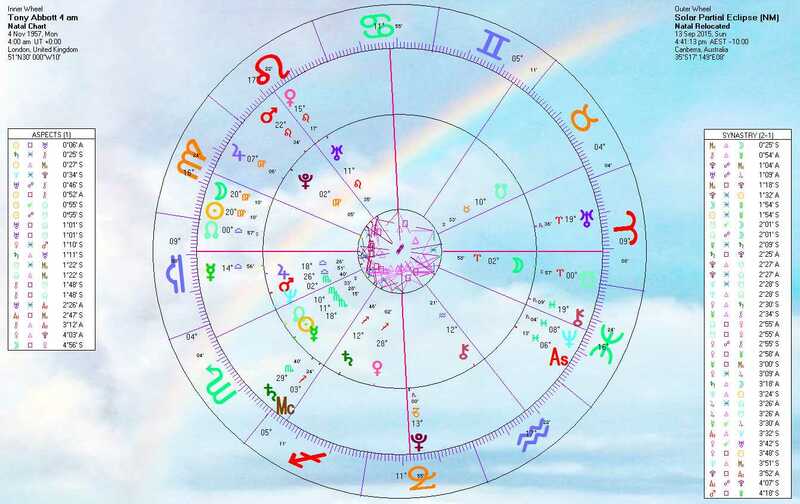 Here is the Transits Chart of the time of the ballot imposed upon Turnbull’s Sunrise Chart (time of birth undisclosed). A positive sign for this change of leadership is the fact that it happened when Mercury was still transiting in direct motion, while the day his cabinet was revealed, September 20, Mercury had turned retrograde. It sounds good for the PM, perhaps not so good for his cabinet. A topic of concern is the Jupiter opposition to Neptune that occurred on September 17, very close to the date of the ballot, an aspect that could inflate collective expectations of what is to come. This aspect could erode people’s trust in this new leadership if matters of importance aren’t disclosed and discussed openly. There is also a risk that someone may decide to undermine the new cabinet’s credibility from within. Many internet ‘prophets’, happy to spook as many people as possible, are reporting that the Lunar Eclipse on September 28 is a ‘Blood Moon’, portending all sorts of catastrophes and even the end of the world! In fact ‘Blood Moons’ are not that rare, the Moon taking on that red-coppery hue because it is at its closest to planet Earth as our planet’s shadow falls on its disk during the eclipse. On all account it has been a bloodily ghastly Moon for many of our prominent politicians. To compound the effects of these eclipses a lasting planetary shift occurred between August and September 2015: Jupiter moved into earthy Virgo on August 11 and Saturn into fiery Sagittarius on September 18. Jupiter will remain in Virgo for one year (to September 9 2016), while Saturn will transit Sagittarius until the end of 2017, with few interruptions. Jupiter and Saturn are the giant of our solar system, their mutual dance in the sky has been considered of the greatest significance for world affairs since antiquity. They were known as the ‘Chronocrators’ or ‘Time Markers’ in classical Greece. Now they are both transiting Mutable Signs, symbol of the ending of something, learning from past experiences and preparation for a big change ahead, namely Saturn entering his own Sign of Capricorn in 2017. 2015 and ‘16 are important years for the Jupiter-Saturn mutual relationship: they have reached a distance of 90 degrees from each other. This coming and going aspect will punctuate the next nine months, with the risk of a general economic downturn very present; recession continuing in some countries and food shortages worsening in less developed ones. This should be a lesson in humility and ‘make do’, getting used to live within our means in the developed countries, to restore some balance to our lop-sided world. A real global recession may be less likely because it is more often associated with the opposition between Jupiter and Saturn rather than their right angle (historical examples of opposition periods and global downturns: 1890-1931-1951/52-1969/70-1989/90-2010). The planet of abundance and opportunities is now in the Sign of hard work, humility, even poverty; while Saturn, the cosmic energy that limits and grounds everything, is now in Sagittarius, the Sign of freedom, philosophy, hope, aspirations. We could seek more concrete ways to tackle our global problems. Jupiter in an Earth Sign and Saturn ‘earthing’ a Fire Sign promise a big reality check for the world. Jupiter and Saturn are also in turn aligned to Neptune in Pisces making their interaction more complex by introducing a spiritual element, the theme of the global environment, the dream of a united, at peace humanity, the gift of compassion and inclusion (Germany opened its door to thousands of refugees in September, around the time Jupiter opposed Neptune, September 17). Pisces is the Sign of the great Ocean Mother to which everything and everyone return in the end. The issue of rising sea levels could also be big in the news during the active period of these planetary configurations. The Jupiter opposition Neptune effect is now passing, but the square Saturn-Neptune has still to become active, in November 2015 and again in June and September 2016. This transit describes a powerful tension between our best humanitarian aspirations and the realistic limits of implementing them. The downside of the Neptune connection could be that, whatever useful reality check we are experiencing, we could still feel unclear about our global goals and the road to peace, Neptune in Pisces possibly fogging these issues or making our collective efforts less effective. On the bright side, contrary to what many astrologers predict (for instance an increase in religious fanaticism and division brought about by Saturn in the often self-righteous Sign of religion) I feel and hope that the open minded, cosmopolitan, multi-cultural outlook of Sagittarius could help seeing the issues in a less personalized, biased or BW way, as it happened when Saturn was transiting Scorpio (2013/15), a highly polarizing and judgmental Sign. Let’s not forget also that the dangerous right angle between destructive Uranus and Pluto is now at an end, the last pass exact in March 2015. This to me seems to indicate that things may actually somehow improve. A more radical shift, with an end of the present severe crisis, will not occur however until 2020, when Saturn in Capricorn will catch up with Pluto, ending their mutual cycle that culminated in 2001 with their opposition (9/11). 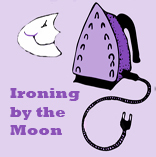 More posts in the oven about the transits of Jupiter in Virgo and Saturn in Sagittarius. Stay tuned.